The Mines Press can help you create a professionally-designed sticker in just minutes. 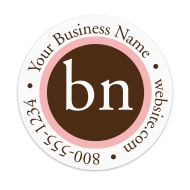 Choose a label template that represents your firm best, and send us your imprint information and/or logo. It's that easy. Our designer stickers and labels are available in a variety of sizes, with classic and modern styles. Label all of your firm's mailings, folders, packages and more. The Mines Press collection of pre-designed customizable stickers has everything your law firm needs to start labeling in a professional way. 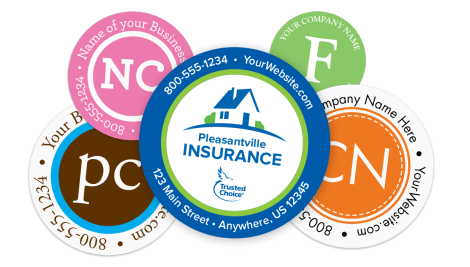 These stickers are sure to enhance your work, your brand, and your agency's overall value. Choose one of our templates and send us your custom logo to be printed with one of our pre-designed messages, or simply send us your business and/or contact information and we will incorporate it into one of our designs. Our "Thank You" stickers will help you show how much you appreciate your clients for trusting your firm, for using your services, and/or for providing referrals and helping your firm grow. 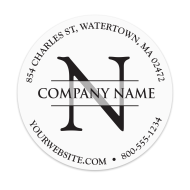 Our trendy monogram and initial stickers will help you display a modern image that will give a sophisticated look to all of your packages, mailings, folders, handouts, and more! Use our pre-designed labels and stickers to promote your firm and to create a stronger brand presence, or use them to bring new life to an existing promotional campaign that is losing steam.